Dimensions 0.50 by 7 by 9.20 in. An education leaderâs job can seem overwhelming, but it doesnât have to be that way. Research shows that by spending time on just a few high-payoff strategies, leaders can bring about the meaningful change their schools and districts need. High-Payoff Strategies helps administrators lead successful change initiatives by focusing on the three top priorities identified by research and practitioners alike: fostering a supportive district and school culture, leading instructional change, and building a learning community among faculty and staff. Drawing on the latest research as well as hundreds of interviews with education leaders, High-Payoff Strategies reveals what it really takes to bring about school turnaround. The book includes rich and varied examples showing how real-world education leadersâin urban, suburban, and rural settingsâhave successfully led changes in their schools and districts. It also provides tools that readers can use immediately to put these practices in place, together with videos demonstrating the practices in action. 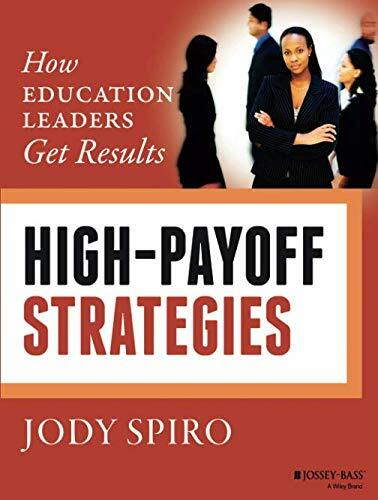 High-Payoff Strategies helps education leaders create schools and districts that support teachers and make a difference in the lives of children. About: Focus on the right things An education leader’s job can seem overwhelming, but it doesn’t have to be that way.